Wishing all readers across the globe a very very Happy and Colorful holi. 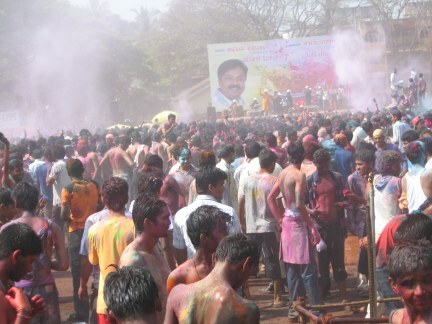 In Belgaum from the past year the main attraction has been the Holi Milan program organized by MLA Abhay Patil on Lele Grounds. Even this year Holi Milan program has been organized from 9 am. Some local residents have opposed the use of Lele grounds for other than sports. There are only two Ashthama temples in India the other being in Madhya Pradesh. For the entire year the women cant enter the temple sanctum but tomorrow all are allowed to go in. Happy holi to all AAB readers and AAB team.. But I Pray to Lord 2 add more Colors 2 ur Beautiful Lyf…. Happy to all my hindu brothers and sister across the globe map. May this holi brings colourful day in your life.